How Many People Have Their Dreams Job? - Ex of Introvert How Many People Have Their Dreams Job? How Many People Have Their Dreams Job? 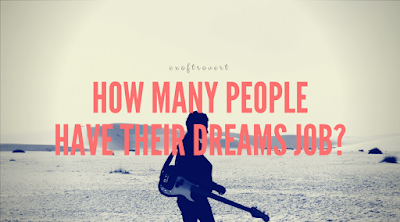 How Many People Have Their Dreams Job? - What did you dream about your job in the future when you were young? Do your current job is a reflection of your dreams? Some people may not, what about you? Having a dream job is commonplace. However, how many people work successfully according to their dreams? The answer is quite astonishing because it is not much. Based on a survey released July 2017 by LinkedIn, one of the world's largest professional networks, only 13 percent of young professionals have the exact job of their dream job. In addition, 29 percent admitted that the current job still has to do with the type of their dream job while 60 percent said the work is now completely different from their dreams. Their dreams type of these young mostly to become a doctors or nurses, businessmen, teachers or lecturers, soldiers or police or any kind of career in the field of military and scientists and maybe president of the state. The survey was conducted on 1,000 respondents, with 16-23-year-old student categories and young professionals aged 25-36 years who have two years of work experience. Each category amounted to 500 respondents. From that survey, they have also mentioned that the first reason they work in their workplace now because they do not have the opportunity to pursue their dream because of educational background and abilities. The second reason is that their interests have changed. And the third reason is that they have family commitments and other reasons that made them can not achieve their dream jobs. In addition, they consider to choosing the current job as it is in line with their educational background and abilities. And of course, the salary they have received and profits are good. And one of the last reason is when they said that they have a high interest and expectations in their current job and the job also has a special meaning for them. Home » Career » Life » Lifestyle » Social » Work » » How Many People Have Their Dreams Job?